On Wednesday 28th June the J B Spray building in Radford was squatted. It was illegally evicted by the police on Friday 30th June and reoccupied on Saturday 1st July. A new squat is born in Squattingham! On the evening of Wednesday 28th June a group of young,homeless, socially minded individuals occupied the J B Spray building at 10 Short Hill in Radford (just off Forest Road West). Built in 1870 the historic lace mill, a grade 2 listed building, has sat empty for years while the owner apparently seeks community uses for the property. Unwilling to see such a beautiful building left to rot this inspired group is seeking to answer both their own need for housing and the wider community need to reclaim spaces like these as social spaces to share and bring people together. Around 10am on Friday 30th June a woman claiming to be the owner (the real owner according to the land registry is actually a man) arrived accompanied by a couple of builders. Becoming apoplectic on seeing the building had been occupied she proceeded to destroy the section 6 notice and called the police claiming the building was being burgled and the burglars were still inside. The police duly showed up but were deaf to the protestations of the occupiers and their supporters outside that in fact and in law no criminal activity was taking place, that this was a civil matter and as such should be pursued through the courts. The police continued to act on the instruction of the self appointed “owner” without any proof that she was the owner at all. Very quickly the senior officer decided that the squatters must be removed. Reinforcements were called and by 11am at least 10 marked police vehicles had arrived plus two dog units. Aggravated that the supporters outside the building knew more about the law than the police themselves the police decided to remove them so that they could not witness the illegal eviction take place. The street was cordoned off and no access was allowed to anyone seen to be supporting the squatters. A registered NUJ journalist who showed up to cover the event was treated with the same disdain, he received no co-operation from the PC guarding the road and was also denied access to the scene. Meanwhile the supposed owner was not removed from the scene! When asked why the police persisted in this ridiculous over-reaction PC 2913 from Carrington Police Station informed us that as they were responding to a burglary they must remove the occupants from the building. When it was pointed out that this clearly wasn't a burglary PC 2913 responded that the squatters would be arrested, held at the station for about 6 hours and released without charge thus returning the building to the woman who claimed to own it. Some time after 11am the 3 occupants, who were in the building when the police arrived, decided that given the massive police presence, including dogs, no interest was served by attempting to hold the building. They surrendered themselves to the police and were arrested for trespass with intent to commit criminal damage. They were released some 8 hours later without charge from Bridewell Police Station. Despite or perhaps in spite of the illegal actions of the police the group was not deterred from their original plan. On the evening of Saturday 1st July the same group who originally squatted the J B Spray building reoccupied their new home after their illegal eviction the previous day. They enjoyed a beautiful weekend cleaning and organising their living space while showing their friends and supporters around the amazing building which includes one of the most amazing panoramic views of Nottingham. Further builders showed up on Monday 3 July claiming that they had work to do in the building but this time the police were not interested in the wild protestations of the so called owner and informed her that it was a civil matter and had to be pursued through the courts. It appears the police have had a little lesson in the law over the weekend! "PC 2913 from Charing Cross Station"
s/he must have come a long way! do you mean canning circus? Section 6 notice later destroyed, folks lead away in handcuffs, later released without charge .... well, they didn't do anything wrong ! Building is now re-occupied. I expect to be a frequent visitor, so, will update all on the new squats' progress. Well done all. "There are currently 58,192 derelict homes in the region, blighting their communities". Does this strike anybody as unreasonable? 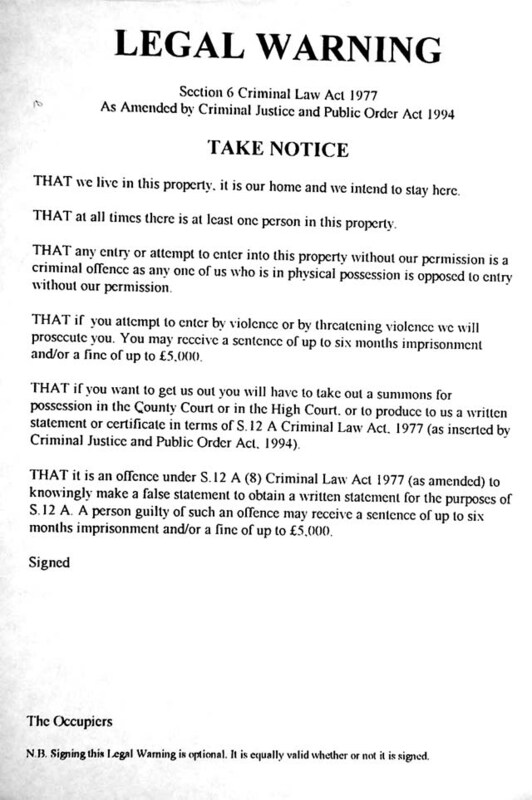 Good photos of the illegal eviction...I hope the wrongly arrested squatters are going to sue the police for wrongful arrest etc.....I advise writing their experiences down now, whilst still fresh in the mind, and getting statements off witnesses, and finding a sympathetic solicitor! Good luck to the occupiers...more of this sort of thing!